One of our organic farmers, Manuel, had some beautiful black beans available for sale at the market on Saturday and I couldn’t resist buying them. I soaked the whole bag and cooked them the next day with a chopped onion and a generous amount of epazote (to eliminate gas – or at least we always hope so!). 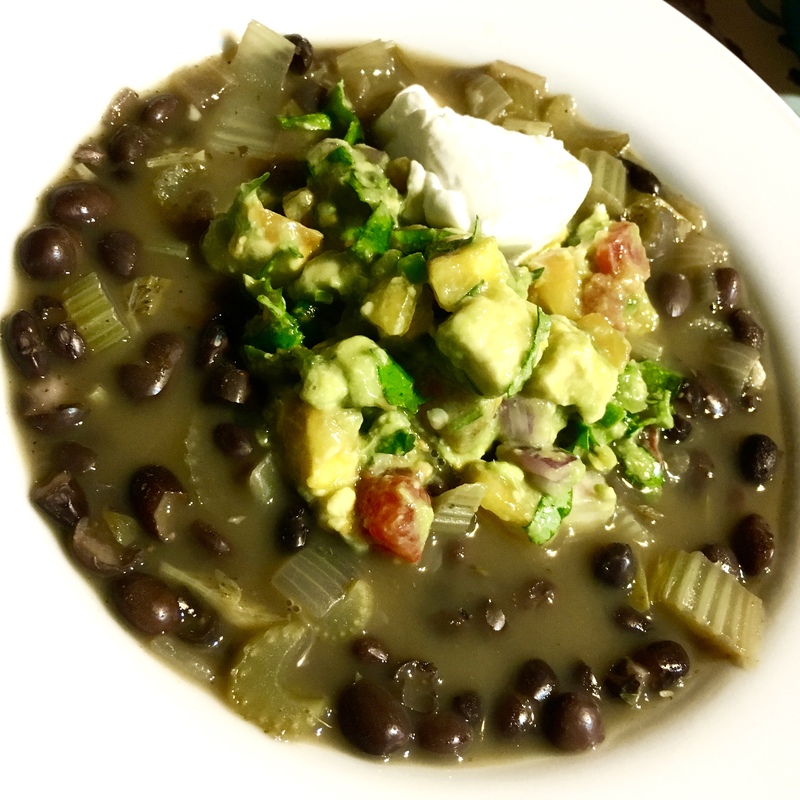 With some of the soaked beans, I made a slightly modified version of a recipe from the New York Times by Mark Bittman, for Black Bean Soup With Avocado Salsa. I made the soup on the stovetop (not in a pressure cooker), added chopped celery, and did not put the Spanish chorizo in as the recipe called for. This is a delicious soup and what makes it really special is the generous dollop of Avocado Salsa to garnish. I added a dollop of thick sour cream as well – really nice complement to both the soup and the salsa. 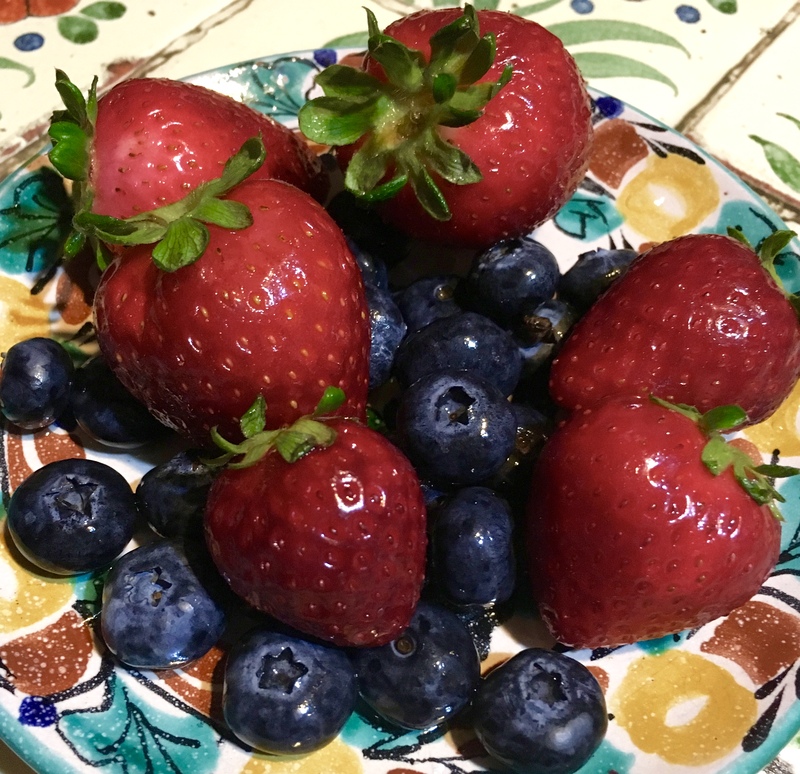 Our dessert tonight were the beautiful fresh organic strawberries and blueberries that were fresh-picked in nearby Pescadero – unbelievably sweet and delicious! Tagged avocado, black bean soup, black beans, blueberries, chorizo, delicious, epazote, farmer, fresh-picked, Mark Bittman, New York Times, onion, organic, Pescadero, recipe, salsa, sour cream, strawberries, sweet. In my last post, I was telling you how much we enjoy Melissa Clark’s recipes and videos. She is an absolute delight and her recipes are fresh, fun and fabulous. The recipe that I’m going to introduce you to here is a prime example of what we’ve come to expect and enjoy from what she’s creating. Many of the ingredients in this recipe we sourced from our local organic market which is located just half a block up the street from where we live in Cabo and is open Wednesday and Saturday mornings. A fresh, free-range organic chicken, organic lemons, Mandarin oranges, honey, carrots, onion and green onions all combine to make this a truly delicious and flavorful dish. A few steps outside the front door is where I have fresh herbs growing, and I cut some fresh thyme and Italian parsley for the recipe as well. I highly recommend that you watch Melissa’s video to get a sense of who she is and the fun she’s created with this dish. You can just link to the recipe, but you’ll miss her delightful personality. This dish is described as a “chile-flecked, honey-imbued marinade spiked with fresh citrus juice that gives this chicken its fiery, syrupy character. Dates and carrots give the sauce texture and additional sweetness while a garnish of fresh herbs and pistachio nuts lends freshness and crunch.” This is a really fabulous dish that can be prepared a day in advance, making it perfect to warm up in the oven for a dinner party. Serve with rice or something else to soak up and savor the sauce with. This is absolutely a five-star dish that I highly recommend! Tagged carrot, citrus, cookbook, crunch, dates, Fiery, free-range, fresh herbs, green onion, heat, honey, Italian parsley, lemons, Mandarin orange, marinade, Melissa Clark, onion, organic, personality, pistachio nuts, recipe, recommend, rice, roast chicken, sauce, savory, scallion, spicy, sweet, sweetness, thyme, Video. Tequila – Made in Mexico – Naturally! Tequila has been part of Mexican tradition dating back to the ancestral cultures. When natives discovered the blue agave plant and experienced its sweet and palatable flavor, they believed that this was a gift from their gods. Prehispanic towns learned to burn it and extract its juice, which was then fermented. The privilege to drink it was only given to high priests and monarchs to enjoy. Upon the arrival of the Spaniards, this precious liquid was distilled, giving us the tequila we enjoy today. Tequila became the only Mexican product with the distinction of “Denomination of Origin” (D.O.) and can only be named “tequila” if produced in the central part of Mexico, mostly in the state of Jalisco. It must also be made from the “agave tequilana weber azul” or blue agave plant, one of 136 species of agave in Mexico. This plant has long narrow sword-looking leaves and bluish in color. It is one of the most exotic plants in nature and one of the fewest composed of “inuline”, a fructose polymer, which is a naturally sweet ingredient. It usually takes from six to eight years for agave plants to be prime for harvest. Agave plants grown in the Los Altos region of the state of Jalisco are considered better that the ones of other regions because of higher fructose content. Agave are very similar to pineapple plants but stand from five to eight feet high and are seven to twelve feet in diameter. Often believed to be a member of the cactus family, they are actually a succulent and are related to the lily and the amaryllis. Tagged amaryllis, ancestral, blue agave, cactus, culture, distilled, drink, enjoy, exotic, fermented, fructose polymer, gods. prehispanic, harvest, high priests, ingredient, inuline, Jalisco, lily, liquid, Los Altos, Mexican, monarchs, natives, palatable, pineappple plants, privilege, Spaniards, succulent, sweet, tequila, tradition. Now This Is Customer Service! © 2019 Cooking With Fire.